American Pond brings you the Freedom series of pond kits. 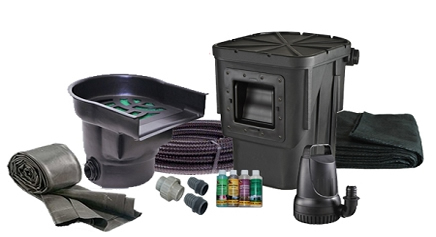 Featuring the highest quality materials, we offer a wide assortment of pond kit sizes. Our skimmers and filters are extremely durable and are American made. They come with an unprecedented Lifetime warranty! Our underlayment is 25% thicker than most kits on the market. Our pond liner is American made by Firestone and comes with a 20 year warranty. Even our pumps are better! We searched the world for a high quality energy efficient waterfall pump that will last, and we found it!